Forum Research released its latest federal polling numbers via The National Post on Monday, showing the Liberals stopping the steady decrease that had been occurring in Forum polling since May. However, the poll has the same sampling issues I have identified before, as I will explain in detail below. But is it a sampling issue or a weighting scheme? The poll itself, despite the Post's excited headlines about a Liberal surge, shows no significant change from Forum's last poll taken a month ago (when the Post was similarly effusive about how the summer was going well for the one-point-gaining Conservatives). The poll does show the Liberals rebounding from a steady decline in support, from 44% to 38% to 35% between May and July, however. The Liberals were up three points to 38% and the Conservatives were down one point to 29%, while the New Democrats were unchanged at 22%. The Bloc Québécois was down one point to 6% and the Greens were steady at 4%. Another 1% said they would vote for another party, and about 4% of the entire sample seems to have been undecided (unchanged). None of these shifts appear statistically significant (assuming a good random sample, see below). The Liberals had a four-point edge among men and an 11-point advantage among women, while they were ahead among voters between the ages of 35 and 64. Oddly enough, Forum put the Tories in front among both the oldest and youngest Canadians. They've bridged the generational gap! Regionally, the only significant shifts occurred in British Columbia and Ontario. In B.C., the NDP was up 11 points to 37% (an unusual, but not recently unheard-of number) while the Liberals trailed at 31%. The Conservatives were down 11 points to just 22% in the province, the lowest they've been here in any poll since an April survey by Harris-Decima. The Greens were up to 10%. In Ontario, the Liberals jumped seven points to 43%, while the Tories slipped to 34%. The New Democrats fell six points to 17% support. Of note, Forum is the only firm to have put the NDP under 19% in the province since an Innovative poll from March 2012. Elsewhere, the Liberals led in Quebec with 38% and Atlantic Canada with 46%, while they placed second in the Prairies with 35% and third in Alberta with 18%. The Conservatives were in front in Alberta (55%) and the Prairies (42%). The Tories were at 14% in Quebec (the third consecutive poll to put them at that number) and 28% in Atlantic Canada. The NDP was at only 24% in Quebec, 23% in Atlantic Canada, 21% in the Prairies, and 20% in Alberta. That unbalance between B.C. and the rest of the country for the New Democrats means that the party would win the plurality of its seats in that province, shifting the NDP's focus from Quebec to the west coast. The Liberals would win around 144 seats with Forum's numbers, while the Conservatives would win 118, the NDP 62, the Bloc 12, and the Greens two (only just). If we use CROP's regional distribution for Quebec, the seat tally in that province changes to 48 for the Liberals, 12 for the Bloc Québécois, 10 for the NDP, and eight for the Conservatives. That shifts the national totals to 155 for the Liberals, 117 for the Tories, and 52 for the NDP (generally speaking, using CROP's regional distribution swings about 10 seats from the NDP to the Liberals). Both Justin Trudeau and Thomas Mulcair showed improvement in their personal numbers, with Trudeau's approval rating up five points to 49% and Mulcair's up four points to 37%. His disapproval rating fell four points to 33%, while Trudeau's 'don't know' score dropped three points to 18%. Stephen Harper's approval rating was down to 30%, his disapproval rating up to 62%. Harper is popular among his own supporters, with 85% approval, as is Trudeau (88% among Liberals). Mulcair has only a 58% approval rating among NDP voters, however. This carries over to the "Best Prime Minister" question, as only 46% of New Democrats actually chose Mulcair as the best option for PM, compared to 71% of Liberals who selected Trudeau and 82% of Conservatives who chose Harper. Overall, Trudeau was well ahead with 32% to 24% for Harper, 16% for Mulcair, and 9% for Elizabeth May. If we take out the "none of the aboves" and "not sures", the three leaders generally line-up with decided party support. May, however, appears to be about twice as popular as her party. Now let's take a look at Forum's IVR sample, focusing on the distribution of respondents by age. As you can see, the same problem that has been identified before in Forum's polling continues. The sample is way too old (61% is over the age of 55, almost double what it should be). To get the proportion of younger voters right, their sample needs to be more than tripled - magnifying any errors that are bound to creep in when the sample is so small. The sample of older voters needs to be cut in half, wasting a lot of the extra precision that is gained from over-sampling that group. For comparison, let's take a look at the sample of Nanos's recent poll. Nanos conducted its polling with live-callers, and had detailed breakdowns included with its Bell Canada/Telus poll (we are usually not treated to such detail with their usual national polls, unfortunately). Nanos has some of the same problems in getting younger people on the phone, as seems to be endemic to the industry, but not nearly to the same degree as Forum. Instead of having to triple the sample of young voters, Nanos has to less-than-double it. Instead of cutting the sample of older voters in half, Nanos only has to trim it by about 25%. Nanos's sample is much more representative. To be fair, Forum has had some decent performances in recent elections. But that may be chalked up to the firm having a good turnout model. While that might be useful for our purposes, what happens when the assumptions that model is based upon turn out to be wrong? In the United States, this is what had Mitt Romney certain of victory even when the national polls showed he would lose. But are we looking at Forum's model in these sample sizes? 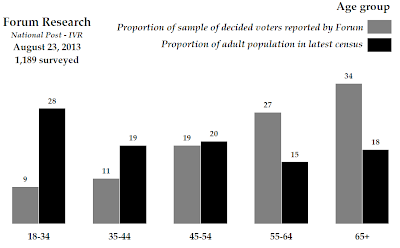 The proportions are remarkably similar to its national poll from May - the 35-44s decreased to 11% from 12% of the sample, and the oldest cohort increased from 33% to 34%. Is Forum showing how it weights the sample by age, or is it just an unusual coincidence? The sample sizes for household income are not the same as in the May poll, though, so it is possible that we are not looking at a weighting scheme. Unless, for instance, Forum changed how they weight by income after analyzing the results of the B.C. election. In any case, this is something to keep in mind when looking at a poll. It should not invalidate its results, though, as Forum's sampling issues are actually quite consistent. That makes it possible to look at the trends from poll to poll. And, in that sense at least, things look to be settling in for the Liberals. Éric, these sampling issues cause me to wonder if it's really justified for you to factor raw sample size into the weighting of polls for your running aggregates and monthly averages. Most of Forum's federal polls (though not this one) have sample sizes of 1,500–2,000, which boosts their weight relative to most other polls with sample sizes of 1,000–1,500. But as we keep seeing, Forum has to make such drastic transformations to its numbers in order to obtain a representative sample that it becomes doubtful whether their larger sample sizes really have any inherent benefit over polls with smaller samples sizes but that achieve more representative samples from the get-go. EKOS is another IVR pollster that tends to have distinctly massive sample sizes and I have to wonder whether it truly merits them the extra weight given to their polls. It is a good point, but it would be difficult to know how to account for this, considering that not all pollsters provide enough detail to figure out how good the sample is. Nanos, for instance, only gives out regional sample sizes in its standard reports. If I'm not mistaken you actually weight by margin of error and not sample size though, right? Since MoE has an "exponential decay" sort of relationship to sample size, I suppose this at least somewhat moderates the additional weight given to polls with ever larger sample sizes. I have to wonder how much of that Liberal "surge" in Ont was actually a reaction to the current Hudak-PC fracas. Yes I know the parties are different but a Conservative is a conservative to most of the public ! As part of the same poll, Forum also found that only 15% of Canadians approve of the prorogation, and even 39% of current CPC supporters disapprove vs. 38% who approve, so that might have something to do with the party's support going back down. Argue as he may that this is just a "standard" prorogation that's nothing out of the ordinary, Harper caused so much controversy with his previous prorogations that I don't think it's possible for him to win the public opinion battle on this one. The current prorogation is not unusual in the slightest. Usually a Parliament has two or three sessions. Since, we are half way through this Parliament a prorogation is expected perhaps even needed to clean the order paper. Nova Scotia with an NDP Government, has held five legislative sessions since the last election for example. Harper's prorogation of 2008 was the result of the NDP trying unconstitutional means to change the Government. The GG was right to agree to prorogue the House since, the Government had not been defeated on a confidence motion and it was doubtful an alternative government could be found. I agree that this prorogation is standard, but I also agree with the criticism that the return to Parliament was needlessly delayed for a month. Frankly, I don't know why our MPs get even the summer break off. Are they antsy children? The rest of us are able to survive without it. I can not remember the exact details but, Parliament sat at different times in the past. The summer break may very well be a holdover from the agrarian lifestyle of previous generations. I am not saying the current sitting schedule is ideal but, MPs do need time to connect with their constituents and understand the problems of their riding. I agree, but they already get plenty of time off related to holidays. I can see a summer break lasting, say, a month or so - but this particular one will run from mid-June to mid-October. I agree with Eric here. Particularly when we consider that members continue to draw full pay and benefits when not really doing much for the country. Yes a vacation is needed but three months ?? I never even got a month when I was working !! I do not know the details but my understanding is that parliamentary committees continue to meet during recesses (although I believe they must be re-constituted after a prorogation). In addition we do not know what or how much work a MP may do over his or her vacation. Finally, as someone who travels frequently in my job I can attest to the fact that travelling is esentially work. A MP from BC likkelu acrues 10-20 extra working days per year on travel time alone. Although I agree with Éric that postponing the return of Parliament for a month is unnecessary, I was actually careful in my comment not to pass judgement. All I was saying is that it's not at all surprising that the public will now automatically react negatively to any prorogation simply because of the controversy Harper previously created with prorogations, and to be fair, that Dalton McGuinty added to most recently. Whether or not you agreed with them, there's no denying they were controversial: the 2008 prorogation was the first time the manoeuvre was ever used to explicitly dodge a non-confidence vote the government was sure to lose, and the following year's prorogation was pretty much unanimously condemned as unwarranted and politically devious. Ditto for McGuinty's prorogation last year. The result is that the public has now been thoroughly conditioned to think "prorogation = bad". I am afraid you are incorrect. Macdonald requested and received a 10 week prorogation in the middle of the Pacific Scandal before a vote on a censure motion the Government was sure to lose. Strangely, while the BQ had committed to supporting a NDP-Liberal government on confidence motions, they had not agreed to defeat Harper, although they had indicated they were prepared to do so. I do not think this ambiguity coincidence. Had there been no request for prorogation the weekend (the confidence vote was scheduled for Monday) would have been filled with negotiations between the Tories and BQ and likely between the BQ and the NDP-Liberals. In short there was no reason why the Governor General would believe a BQ-NDP-Lib coalition would have the ability to carry the will of the House or remain in office for a suitably long period of time. No doubt these factors contributed to her decision to grant a prorogation. I agree with you that recent prorogations have given many members of the public with the erroneous idea that they are uncommon and devious=bad. "In 1873, during the 2nd Canadian Parliament, Prime Minister Sir John A. Macdonald asked Governor General the Earl of Dufferin to prorogue parliament in order to stop the work of a committee investigating Macdonald's involvement in the Pacific Scandal. While the Governor General did reluctantly prorogue parliament, he limited it to a period of ten weeks, appointed a commission to continue the hearings, and gave it until parliament reconvened to report. When parliament returned and the commission presented their findings, Macdonald was censured and had to resign." "When, in 2002, Governor General Adrienne Clarkson agreed to prorogue the legislature at the direction of Prime Minister Jean Chrétien, the latter avoided tabling a report to the House of Commons public accounts committee regarding the sponsorship scandal that, at the time, surrounded Chrétien's party. After parliament was again summoned, investigations into the scandal continued, Chrétien stepped down as prime minister in December of the following year, and the Liberal party was reduced to a minority government in the subsequent election of 2004." Then it mentions the 2 by Harper, and finally McGuinty's. Article = "Prorogation in Canada"
If I was an Dipper I would be very concerned with Mulcair's numbers. A majority of Dippers picked someone other than their leader to be best PM. This coupled with a trend of decreasing public support nationally (with BC being the lone exception). In Ontario they are essentially at their pre-Jack levels. Interestingly, the NDP seems to be growing in BC, the Prairies and slumping in the East, Quebec and Ontario. To me it appears that the NDP has not consolidated the gains of 2011 even among their own supporters. For this reason I suspect the current polling numbers we see 22%+/- is more of a ceiling than a floor of NDP support. Ya, I'm a NDP member, and I never voted for Mulcair. He should just hop over to the Grits and be done with it. We already have our fair share of gigantic egos. Thank you very much. I have to admit, if we voted for MP and PM separately, I would still vote for my incumbent MP and be tempted to spoil my ballot for PM. I just don't feel like there is any real leadership anymore. If I was taken back to an election like 1993, I would be hard to choose one candidate to be PM, and now it would be hard to find one candidate to be PM. If I understand you correctly, you consider the crop of PM candidates from 1993 to be better than now. So Jean Chretien, Lucien Bouchard, Preston Manning, Audrey McLaughlin and Kim Campbell would be better options than anyone now, and yet you think Muclair is more like a Liberal than, say McLaughlin? I must say, I think there's a reason why Elizabeth May is twice as popular as her party. Given her honesty, intelligence and work ethic, I think she's the best of the crop of party leaders currently. As for Mulcair, maybe he's not a "Liberal in NDP clothing" but he does seem to be deliberately trying to act like one. For example, by being mostly in agreement with the Conservatives on foreign policy (including on wars). By completely ruling out lowering our ever-rising income inequality by creating a new tax bracket for the rich (something his main leadership rival talked about a lot), even though the idea is broadly popular with Canadians. As far as I can tell, the only reason he's taken this position is because he doesn't want to seem like an extremist, and he's gotten the impression from the Tea Party politics down south that the idea makes one unelectable. McLaughlin was the one off leader for me in that election. What I mostly talking about is leadership. If I'm looking at 1993 from the point of view as a voter watching election coverage, I could honestly see any of them (except McLaughlin) as PM. I would not know how they would act later as PM and opposition leaders, so I wouldn't know who was going to be craven. I don't think raising taxes is popular among Canadians. High income Canadians (and for the record I am not one of them) are taxed at a minimum (Alberta) of 39% above $135,000. So, 40 cents on the dollar go to the tax man. In Alberta maybe one could argue taxes are too low but, a 46% marginal tax rate for people in Quebec who make $80,000 is outrageous. $80,000 is barely adequate to raise a family and buy a house-these people are not rich! I still think (At least in BC) that people making over 100,000$ a year could take a little boost (3%) in their income tax. the benefits of that money being invested properly into social development are just to good. In the U.S., the Walton family alone have more wealth than the bottom 40% of Americans. Canada's not quite that bad, but we're moving in the same direction, for no good reason really. Taxation (coupled with using the new revenue for public infrastructure and skills (re)training) is not the only solution for closing the growing inequality gap, but it's the most direct one, and frankly it shouldn't be that difficult to make the case that a return to the (still large) income inequality Canada had 20 or 30 years ago isn't a radical idea. Mulcair's lack of attention to the issue isn't very NDP-like. Firstly in a time of aging demographics and mediocre productivity income tax is a regressive tax that hinders not grows the economy. It stifles investment and essentially taxes growth at a time when older Canadian should invest in order to boost income during their retirement. A consumption tax (the GST/PST) would be far more progressive and would not hinder investment or growth to the same degree. Income above $100,000 is already taxed at 39% in BC! People who make 100,000 are not rich they are working middle class families. Perhaps a case could be made that people in the Interior where house prices are low should pay more tax but, when the average urban British Columbian carries a $600,000 mortgage or $4,500 per month on a gross monthly income of $8,333 ($100,000 per year) one can readily see most middle class British Columbians have little money to spare. Finally, taxing the 1% (1% being a term of class warfare if not outright discrimination by "leftists") will have minimal success. One need only look to France where a 75% tax rate is applied to income over 1 million euros. The result has not resulted in a windfall for one very obvious reason: People with high incomes have the means to live where they please. In France the 75% tax rate has been a boon for the City and England as rich French men and women live in London and fly to Paris daily for work. No matter how you score it Canada is one of the more highly taxed jurisdiction in the world. West Coast Politics : "Well, the NDP is sort of becoming un NDP-like along with him." The usual assumption when people make claims like this about the NDP under Mulcair or Layton, is that before them the NDP was more progressive, or leftist, or socialistic, etc. But to believe that, you have to forget (or not know) that, for example, the last time the NDP were riding high in the polls - under Broadbent in the 1988 federal election - they decided (on the advice of a US PR firm) to ignore the Free Trade issue in their campaign and focus on health care. That was a complete about-face on NDP policy - and it also yielded turf to the Liberals, who road opposition against Free Trade to Official Opposition status. Or, when Alexa McDonough was leader, she argued for ditching the NDP's social democratic principles in favour of (Tony Blair's) Third Way - no more than a cover for neo-liberal policies. That policy platform would have made the NDP the equivalent of the Liberals under Martin or Chretien or Ignatieff. When Layton became leader, he made changes, some outside of the social democratic orthodoxy, but none that I can think of that were not on balance arguably progressive. Mulcair seems to have followed in the same vein. I had serious reservations about Mulcair's foreign policy, but on becoming leader he at least pledged to follow the will of the party on such issues as Palestine-Israel, and so far he's pretty much done that. Neither Layton nor Mulcair is my ideal or without fault, but I can't see how they aren't the most progressive leaders the NDP has had since Tommy Douglas. Admittedly, their competition is underwhelming. That being said, maybe the current “un-NDP-like” NDP is really a question of style… maybe people are still having trouble picturing the party in Official Opposition or even as the government. We’ve been told all our lifetimes that the NDP is the party of losers and maybe folks can’t adjust to a new reality. That’s forgivable in people who never would have considered voting NDP anyway, but it’s self-defeating and lazy thinking for any supporter or fellow-traveller. The NDP is becoming less "hardline". They removed socialist from the pre-amble of their constitution. They no longer state (at least publicly) they wish to abolish the Monarchy etc...Having said that I certainly think a party may change policy when they wish. Let us also not forget the NDP have enough regressive policies to uphold or at least please traditionalists, opposition to the carbon tax being but one example. In 1988 there was no doubt the NDP was opposed to the FTA. My remembrance is that their opposition was the hallmark of the NDP 1988 platform. The emphasis on healthcare was part II of that strategy and worked as a juxtaposition toward Free Trade and hence "Americaness". The platform was a massive success the NDP scoring the most seats in their history. Is Mulcair doing a good job? That is for Dippers to decide but, my reading of polls leads me to the conclusion that Mulcair has mainly squandered Layton's inheritance. Regarding the NDP being less "hardline"... that sort of language hasn't reflected their policies or platforms for a very long time. My recollection of polls was that the NDP was riding high some months before the election and hit a high water mark roughly a year before Nov. 1988. Also it should be remembered when the NDP polled high it was a Ed Broiadbent endorsement not a NDP endorsement. finally, unlike layton they lacked most of the riding infrastructure needed for a big win. Yes, the NDP machine was weak in Quebec in 2011 but, it was miles ahead of the NDP in Quebec circa 1988. Overall I think your assessment far too harsh. I am unsure why you feel the language outlined has not reflected NDP policy for a long time? "Socialist" etc... was only removed from the party's constitution in April 2013! Bede I'd have to disagree with you. As a more traditional NDP voter I'm quite please with Mulcair's performance, particularly on non-ideological issues such as the Senate. The fact is Mulcair knows Canadian's prefer open trade markets, and wouldn't appreciate anymore tax increases. I may be inclined to disagree with him on those two options, but that doesn't make him a "Blairite" in the slightest. His brand of politics is a more open minded, consensus approach to governance. That might make him more of centrist in many opinions, but he knows better to focus on protecting Canadian institutions, rather then forcing more radical changes. If Mulcair wins in 2015, eyes should go towards who he chooses for his cabinet. It will be a balancing act of more left wing opinions, such as Peggy Nash and Libby Davies, and the more centrist voices such David Christopherson. Right now Trudeau is all over Mulcair's lunch, particularly on the marijuana issue, but when voters go the polls, how will his pot stance, coupled with his lack of experience, weigh on their minds? Mulcair may need to abandon some hardliners to the Trudeau camp if it is necessary for the NDP become a serious government option. First, to put things in a more accurate light, the new preamble to the constitution says the NDP "brings together the best of the insights and objectives of Canadians who, within the social democratic and democratic socialist traditions, have worked through farmer, labour, co-operative, feminist," and other movements. "[T]he production and distribution of goods and services shall be directed to meeting the social and individual needs of people within a sustainable environment and economy and not to the making of profit." In my opinion Mulcair and the NDP's position on the Senate should be cause for concern among NDP supporters. Abolition only alienates many Westerners and Atlantic Canadians. More importantly it raises other constitutional issues. The NDP policy on Quebec separation no matter how defensable it is in Quebec will alienate most of Ontario and goes against the Clarity Act and SCOC reference decision on Quebec separation. It is difficult to defend a policy that contravenes federal legislation (especially legislation that holds wide spread support amongst Canadians). In my opinion the positions are not vote getters. When do we get the Globe pot poll on here ?? Are you referring to this article, which I wrote? How safe is Toronto for the OLP?